Stunning WHITE Bathroom Cabinet / Vanity with Wavy Double Basins 1440 mm L, 2 drawers, Ref KCV144W Size: 1400 mm L x 500 mm D x 550 mm H In brilliant white gloss paint, walnut / oak/black finish. Optional Tall cabinet( wall), mixers and Mirrors. 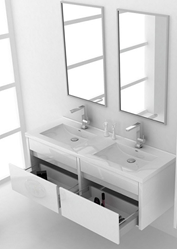 Striking in its simplicity, this double bathroom cabinet offers modern sophistication to your bathroom. Its large countertop has a unique wavy bottom for splash of fun. The 2 drawers feature Blum soft close drawer sliders ensuring they close silently and effortlessly every time. Note . Price excludes the mixers, basin wastes and mirrors. Optional mixers, tall cabinets, mirrors and mirror cabinets.